With a scattered workforce, ISS found it challenging to precisely track time and attendance. This created a lot of problems. Employees weren’t always properly compensated for overtime and meal breaks. Blended overtime was difficult to calculate correctly. Some employees were failing to clock out, and a small group of managers were improperly changing employee time cards and work rates. 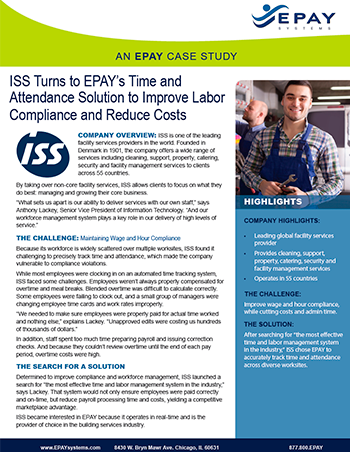 After searching for “the most effective time and labor management system in the industry,” ISS chose EPAY’s time and labor management system to accurately track time and attendance across diverse worksites. Because of EPAY Systems, we have attained real-time transparency into our workforce.